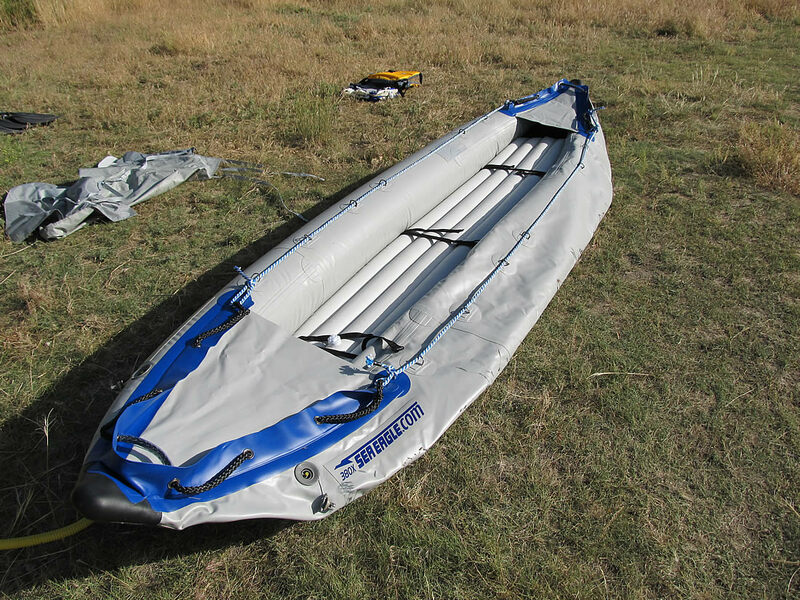 To those unfamiliar with expedition level inflation kayaks, such as the Sea Eagle 380x, it might seem strange that an article even exists about why a person might want to “beautify” their kayak by running rope down both sides of the boat. However, once a paddler has experienced the wonderful uses this rope provides, they’ll wonder how they ever got along without it. Sea Eagle Kayak with Marine Rope down both sides. It makes attaching bags and other items to the boat so much simpler! 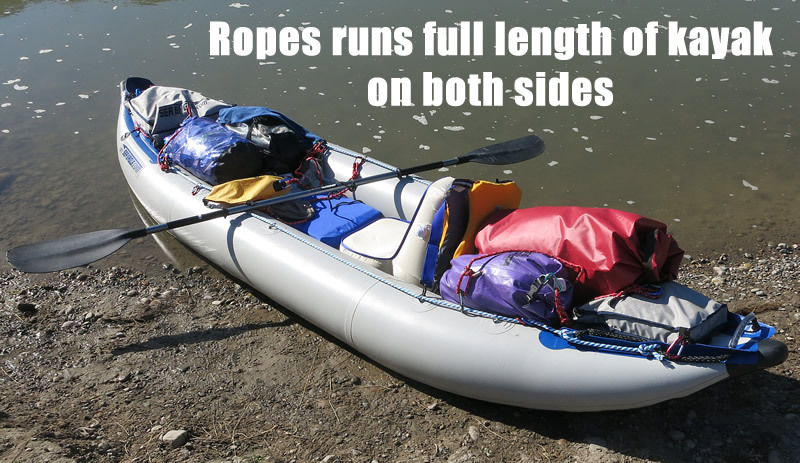 Since I’ve come to love this rope and keep it attached to my kayak at all times, and use it in some fashion during every float trip I take (short or long), I felt it was time to promote the novel idea of attaching rope to the sides of inflatable kayaks. The idea of stringing rope down the sides of an inflatable boat is hardly a radical idea. After all, I picked up the idea from another inflatable boat I already owned, a Sea Eagle motormount inflatable raft (the now discontinued SE8). On this raft, a thick, soft rope ran around the entire perimeter of the boat. I found myself using this rope to attach bags, boxes and coolers to the boat so that if the boat capsizes, these items wouldn’t float away or disappear into the rivers depths. I also found myself using this rope to haul the boat out of the water, lift it into my bed of my truck, and countless other uses. I became so used to this rope that during my maiden voyage in my new Sea Eagle 380x, I discovered I missed it terribly. I’d try to attach my small dry bag (that carried my wallet, keys, etc…) to the boat and, alas, found nothing there. Ditto for when I tried to attach my sandals or countless other items. But that was small potatoes compared to when I did my first overnight trip. With all sorts of dry bags, I quickly ran out of spots to easily attach the bags to the boat. That whole trip was an organization disaster, to put it bluntly. The rope I installed on the kayak is easy to see in this photo, running the full length of the boat. Makes everything a snap to attach things. Following this mini-disaster of yet epic proportions, I resolved to solve this problem once and for all. First I bought a few extra D-Rings and glue from Sea Eagle and attached them onto the boat, where they remain to this day. Second, I bought 40 feet of quality marine rope (also known as boat line) from NRS, and then cut it into half sections. This is the same rope that was used on my inflatable raft. The reason to use marine rope, which is made from polypropylene, is because the rope is very soft to the touch, won’t rot, develop mildew, is very strong and it stretches. And should the rope fray, the rope doesn’t develop sharp points like nylon rope does. Finally, the rope is thick (I bought the ½), making it easy and pain-free to grab it without slicing your hand. Once my supplies arrived, I spent an hour attaching the D-Rings and then strung the rope. And life has never been better. All my organizational woes are gone. I can attach dry bags, coolers, and anything else simply to my boat at any location I desire. Best of all, I can move those items along the length of the boat without having to waste time detaching bags and then re-attaching them. In short, it has made boat organization far simpler than what it was. And it’s provided endless options for how I can organize things in the boat. The rope has made life simple. Easy, even. The way it should be, right? Marine rope, or boat line, that I used on my Sea Eagle Inflatable Kayak. Rope is available through NRS.